Otdykh Medical Tourism, Spa & Health, 10th International Conference and Exposition for Wellness and Medical Travel. Euroexpo LLC (Moscow), a member of the Global Association of the Exhibition Industry (UFI), the Russian Union of Exhibitions and Fairs, Moscow Chamber of Commerce and Industry, the International Congress and Convention Association (ICCA), and Euroexpo Exhibitions & Congress Development GmbH (Vienna). Ministry of Culture of the Russian Federation, Chamber of Commerce and Industry of the Russian Federation, Federal Agency for Tourism of the Russian Federation, Russian Union of Travel Industry, Association of Tour Operators of Russia. “Tourism is one of the most popular business segments in our country and throughout the world. That is why this event will undoubtedly become a very important business and communication platform for the successful experience exchange and discussion of the actual problems in the tourist sector. It is highly important that the exhibition conferences will be focused on such topical issues as modern IT-developments in tourism, problems of business and health tourism, as well as education in the tourism sector. I am confident that the discussions among the participants will result in elaboration of a series of practical recommendations”. Country Partner of Otdykh: Mexico. The Conference “Modern IT technologies for Tourism” is supported by “Voroshilova and Partners” internet agency. the Official Hotel is Sovetskiy. The partners offer all OTDYKH exhibitors and visitors special conditions for flight and staying. This year the anniversary OTDYKH LEISURE exhibition starts with a new image. The event’s philosophy “Home of Tourism” proves a significant interest growth to the show among the exhibitors from Russia and abroad. For the first time Paraguay and Ajman emirate will demonstrate their tourist destinations and services. Over 30 recreation facilities of the Crimea will take part in OTDYKH at the region’s collective stand. Extensive and exclusive expositions will be demonstrated by Arab Emirates, Latin America, China and Turkey. Russia will be represented by 23 regions, including Arkhangelsk region, Vladimir region, Vologda region, Irkutsk region, Kaliningrad region, Kaluga Region, Republic of Karelia, Kostroma region, Moscow region, Yaroslavl region, Murmansk region, Nizhny Novgorod region, Novgorod region, Ryazan region, Samara region, Sverdlovsk region, Smolensk region , Stavropol Territory, the Republic of Tatarstan, Tula region, Chelyabinsk region, Leningrad region, the Republic of Crimea. OTDYKH business programme has been a major highlight of the show for exhibitors and visitors over the decades. This year the OTDYKH business programme includes over 150 co-located events. A meeting of Oleg Safonov, the Acting Head of the Russian Federal Agency for Tourism with the heads of the Russian regions, as well as the 2nd All-Russian Conference “National Association of information and tourism organizations” under the support of the Federal Agency for Tourism will be held within OTDYKH 2014. The annual International Conferences: OTDYKH MICE International Meetings Industry and Business Travel Conference, OTDYKH Medical Tourism, Spa & Health Conference for Wellness and Medical Travel will be running traditionally within the show. Marco Polo Hotel Management, the Sponsor of the Specialized Events, will draw 2 weekend trips for two in Luxe Studio in “Foresta Festival Park” hotel among Conference delegates. The 3rd International Conference for IT technologies “Anti-crisis IT tools in tourism business” will be running on 18 September 2014. Over the years, the Conference has become widely known among hotel booking systems, payment systems and other market players who use the latest IT technologies in their everyday work. Among the Conference speakers there are representatives of Google, Mail.ru, Odnoklassniki, Excursiopedia, SumUp/Svyaznoy Bank, Pay.Travel and many others. Over 300 delegates visit the Conference every year, getting significant practical benefits from their participation. “Sletat.ru”, the Sponsor of the Conference will hold an auction of successful technologies at the exhibition’s Business Zone on the second exhibition day. The 1st International Conference on food and wine travel “Tasteful Journey” and “Career & Education” Conference will be held within OTDYKH on 17 September for the first time. “Career & Education” Conference is designed to help graduate students and young professionals to find their dream job and to improve their professional and competitive skills. Heads of the leading travel agencies will share their successful experience in career building and give helpful tips, and representatives of HR-departments will speak about the modern model of an ideal applicant. The new project “Career Fair” will be running alongside the Conference. In 2014 Russian regions have prepared interesting entertainment programmes, as well as seminars, shows, contests and presentations of tourism opportunities, including Moscow region, Yaroslavl region, Smolensk region, Sverdlovsk region and Stavropol territory. Traditionally, the Association for Assistance to Tourist Technologies will hold a series of seminars dedicated to innovation technologies in tourism. Tourism industry professionals are welcome to attend the interesting events prepared by OTDYKH exhibitors from abroad. Sanya Tourism Development Board will hold a presentation of tourist opportunities of the city of Sanya, “Double Bay Group” will represent tourist destinations of Australia and Latin America. Travel trends of the coming season will be presented by the National Tourism Organization of Serbia and the Ministry of Economy and Tourism of Bulgaria. The Paraguay Ministry of Tourism will make a presentation “Feel Paraguay”. Seminar and attestation of travel agents on Catalonia and Bulgaria will be held by the Catalan Tourist Board and the Ministry of Economy and Tourism of Bulgaria together with the Association of Tour Operators of Russia. “Coral Travel” will present their plans and novelties of the coming winter season, “Transero Tour” will hold a seminar on tourism opportunities of Hainan Island, and “Havanatour Russia” will share the methods of Cuba destinations promotion. The 7th Practical Conference “TBG. Travel brands” will be held on 18 September within the exhibition’s framework. Appointment System: an online system of pre-arranging meetings and negotiations at the exhibition. Special offers for flight and hotel staying from Transaero, the Official Carrier, and Sovetskiy, the Official Hotel of the show. Promising contacts, new customers attraction, the latest information about innovations in MICE-industry — all these is offered by the 10th International Meetings Industry and Business Travel Exhibition and Conference, a global business platform for business travel professionals. In order to expand the exhibitor geography, thus improving business opportunities, the organizers have attracted the exhibitors from Poland, the UK, Portugal, France, Turkey, Germany, Malta, and other countries. Among the exhibitors there are: the State Complex “Palace of Congresses”, “Gorky Gorod” resort, “Asia Adventures”, “Wedgewood”, DEXTER air taxi, “ETNOMIR” park, “Event Media Group”, “Farol Travel”, Irkutsk City Administration, Malta Tourism Board, “Liberty Hotels Lykia”, “MICEGLOBAL” and others. 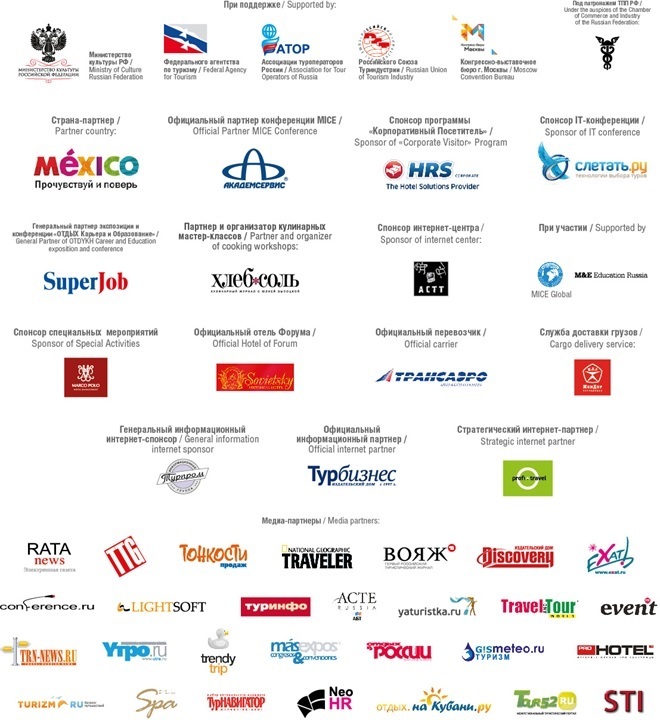 The exhibition organizers actively support the unique educational programme that has become very popular among Russian experts of meeting industry for over 10 years. In 2014, the International Meetings Industry and Business Travel Conference will be held during two days — on 16 and 17 September. The Conference official partner is “Akademservice”, which takes part in OTDYKH MICE since its very first edition. The Conference programme traditionally includes reports of experts from abroad and case studies. Rodolfo Musco, president of “Motivation & Events” will speak about the impact of emotions to increasing the efficiency of meetings and events“. The report of Vladimir Kshnyakin, the “Big Game” project manager in MTS will be dedicated to the non-financial staff motivation in crisis period. Scott Campbell, executive director, Global Industry Development Network will give practical advises on how to make a successful bid. Jordi Robert-Ribes, the director of Connecting Perspectives will make a report on “Keeping the event alive after “The End”. Russian experts will be represented by Grant Babasyan, marketing director of “Gorky Gorod” year-around resort who will speak about the resort’s MICE opportunities, and Elena Lysenkova, the director of Hospitality Income Consulting who will make a report on “10 rules for a modern hotel conference hall in a hotel”. The Conference will be brightly finished with an intellectual teambuilding “Around the world in 60 Minutes” held by Sergey Armishev, the certified business coach, together with SPECIAL TRAINING centre. Corporate Buyer Programme was specially designed for the corporate visitors, who represent companies and associations — the buyers of MICE services. Among the benefits of the corporate visitors, there are a special registration desk, scheduled meetings with exhibitors, as well as participation in MICE Conference sessions. HRS is a Sponsor of the Corporate Buyer Programme in 2014. ABBYY, Beeline, Promsvyazbank, RBK, Rosneft, Coca-Cola HBS Eurasia, Unifarm, Transaero, Bosch, Euroset, Siemens and others have registered for participation in the Corporate Buyer Programme in 2014. OTDYKH LUXURY represents the exclusive offers of international and Russian travel agencies dealing with individual VIP tours, unique resorts, luxury hotels, destinations and other luxury travel segment. OTDYKH LUXURY exposition represents companies from all over the world, providing an excellent opportunity to choose a custom programme for the most demanding customers. Among the exhibitors of OTDYKH LUXURY 2014 there are “Blue Sea Weddings” (Greece), “Let’s Go Maldives” (Maldives), “Pleasant & Gorgeous” (Portugal), “Special” Travel Club (Russia), “Submaldives Private Limited” (Maldives), “Viajes Caribe Maya” (Mexico), Zillertal resort (Austria), Baqueira Beret resort (Spain), “Slavian Tours” (Brazil) and many others. It is hardly possible to know the true temperament and local colour of any country without discovering its national cuisine. Following the global trends in tourism, the organizers of the exhibition for the first time have organized Gourmet & Wine Travel exposition. “Chateau Maison Noble”, “FrancoTour”, “Ad Hoc il Tartufo”, “GEAC Spa”, Museum of the Russian Desserts and many others will show their gourmet offers. The highlight of the exposition is a series of cooking master classes organized by the exhibition’s partner “KhlebSol” magazine with Julia Vysotskaya, that will be held during all 4 exhibition days. The national cuisines of 13 countries will be represented during the show, including Uzbekistan, Russia, Hungary, Bulgaria, the Czech Republic, Mexico, China, Slovakia, Thailand, Serbia, Japan, Italy, UAE. “Natalie Tours”, the Sponsor of master-class of Italian and UAE cuisine will hold a quiz dedicated to Italian historical cities. The winner will be awarded with a sightseeing tour to Italy for two. The participants of the cooking master class dedicated to Mexican cuisine can win an unforgettable dinner for two in “Mexican Club” restaurant, or a flight “Moscow-Cancun-Moscow” from “Transaero Tour”. The fans of Japanese cuisine can win Japanese traditional daruma dolls. The sponsors of Russian, Hungarian, Bulgarian cooking classes will draw a wine of fine bouquet among the participants. The National Tourism Organization of Serbia, the sponsor of Serbian cuisine cooking class will award the winner with the bottle of traditional plum rakia. The promotion of food & wine tours has their own features and peculiarities both in the Russian and international markets. José Borralho, the chairman of the World Food Travel Association and other leading industry experts will speak about the special aspects of marketing and promotion of such trips at the 1st International Conference on food and wine travel “Tasteful Journey” that will be running on 18 September. Russian tourists often combine leisure with treatment while travelling abroad, or choose a resort where they can get quality health and beauty services. Medical tourism is now one of the fastest growing tourism sectors in the world, so OTDYKH Medical Tourism, Spa & Health exposition increases and attracts new exhibitors every year. Among the newcomers of the medical tourism exposition there are “Art-Voyage” (Belorussia), “Bankok Hospital Pattaya” (Thailand), “Berman Tourism Israel”, “Ilmed” (Israel), “INFICARE Korea” (South Korea), Lithuanian Medical Tourism Cluster, “MedEspoir” (Tunisia), “SAGE Consultancy” (Turkey) and other companies and clinics. Health and recreation leisure opportunities will be presented by “Chakra Ayurvedic Resort” (India), “Welna” eco-resort (Russia), “Energetikas” (Lithuania), “Fregat” pension (Russia), “Pomegranate Spa Hotel” (Greece), “TermeKrka” (Slovenia) “Thai Pattara Spa” (Russia/Thailand), and “SAVA Turizem” (Slovenia). The International Conference Medical Tourism, SPA & Health has been held for travel industry professionals for 10 years. This year it will be running on 18 September. Among the Conference highlights are the forecasts for the future industry development, as well as the presentations of the international health tourism destinations, including Israel, Dubai, India, Turkey and Slovenia. Andrea Segedi, the health tourism expert from Hungary and one of the most reputable Conference speakers will share her expert opinion on the best ways of health tourism promotion in the global market, and present her practical marketing course specially designed for the companies working in this tourism sector. Yuriy Fedulov, the director of St. Petersburg affiliate of “Ashmanov & Partners” will speak about the promotion of medical websites in Runet. Elena Yurchenko, the Minister of Resorts and Tourism of the Crimea represents the Crimea and its recreation opportunities. On 16-18 September OTDYKH Lounge Zone will host a series of non-stop open seminars. “Blue Sea Weddings” wedding agency has prepared a special costume show “Once upon a time in Greece” with drawing of a wedding in Greece for two. The Lithuanian Medical Cluster “LITCARE” will hold a seminar on “Resorts, treatment and medicine in Lithuania”. The Palace of Congresses will present wedding events in the Palace and draw 2 vouchers for staying in “Baltiyskaya Zvezda” hotel. Pleasant&Gorgeous, the exhibitor of OTDYKH LUXURY will speak about exclusive individual tours to Portugal. Baqueira Beret, a Spanish ski resort that is relatively new for the Russian tourists, will make a virtual tour to the slopes and present its luxury hotels. “World of Brazil” will present the tours to the home of Carnival. “Welna” Eco Spa Resort will draw a certificate for a weekend stay in Welna" Eco Spa Resort hotel, as well as 2 certificates for spa procedures.